This heavy tome is a reprint of the proceedings of a seminar held at the Institute of Advanced Study at Shimla in 1968 and published in 1969. 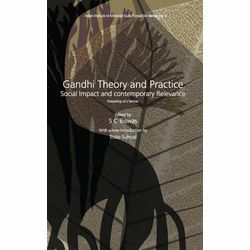 It deals essentially with Mahatma Gandhi’s ideas in relation to economy, politics, ethics and society. The wide scope of the book and the excellence of individual contributors bestow upon it a quality of lasting relevance. That, in fact, is the reason why it has been reprinted. The reader will find ample reward in this serious study of the perhaps the greatest man of our time. Number Of Pages : 710 p.